Early Roman Art, Influenced by Etruscan Culture. Remus being added in the 15th century. In about 160 BCE, the Roman official Caro the Censor ferociously condemned the passion, widespread among the Romans of his day, for refined and luxurious objects, and for decorating their houses in a rich and splendid manner. But he was fighting the tide of history. There was by then a new interest in art, which came to be regarded as a pleasant embellishment to the daily round, and the more severe attitudes of former times were gradually abandoned. In the field of the figurative arts, this brought a progressive Hellenization of Roman art and culture, and a turning away from those traditional ideas that had seen in art a corrupting influence on morals, and had only accepted it grudgingly for purposes of religious observance and of extolling the grandeur of Rome. The sober purity of the ancient clay deities had until then represented the last word in permissiveness: for people to replace these with sumptuous images in the 'Greek manner' was felt by Cato to be a dreadful scandal and a betrayal of the Rome that their ancestors, from the time of Romulus, had handed down to them. The earliest villages on the Palatine - where Rome, according to legend, was founded by Romulus - date from the eighth century BCE and were collections of huts inhabited by shepherds of Latium whose culture was comparatively backward. Typical of their culture are a number of urns made in the form of contemporary dwelling places that feature the door, windows, roof beams and the hole in the roof through which the smoke could escape. At this time there were few places of worship and no divine imagery. This is how Tertullian describes primitive Rome in his Apologeticus: 'Makeshift turf altars ... hardly any smoke for the sacrifices and nowhere can there be seen any images of the Deity himself.' Not far away there were several Etruscan centres that were more in contact with Greece, and they had made rapid advances. As yet, however, no echo of eastern influence had reached Rome. In the valley at the foot of the hills - in the place where the Forum would arise - was a primitive and poor necropolis. At the end of the seventh century BCE Rome came under Etruscan rule. Her strategical position on the road to Campania was of interest to the Etruscans who "vanted to expand to the south. This was the period when Rome first acquired an urban structure. Servius 'Tullius built a surrounding wall on the Etruscan pattern. He, incidentally, is probably to be identified with the Etruscan Mastarna, known to us from several sources including the Francois Tomb at Vulci, where he and other chiefs are depicted after conquering the Roman, Gnaeus Tarquinius. The valley was cleared, and gradually became the meeting place for the villages built on the hills. And, with the construction of a great sewer, the Cloaca Maxima, the valley, no longer used as a necropolis after the beginning of the sixth century BCE, was drained and became the political centre of Rome - which had already become a Republic much earlier, in 510 BCE. lt was the Etruscans who introduced the temple. One that is especially characteristic of the Etruscan style is the temple to Jupiter built on the Capitoline Hill. Even after Rome had experienced the direct influence of Greek works of art, many aspects of the ancient Etruscan temple remained fundamental in buildings dedicated to Roman cults. These long-lasting influences helped to form the foundation from which a truly Roman art arose at the beginning of the second century BCE, notably under Sulla. But the position that ancient art occupied in Roman society was still very inferior: the work of the artist was regarded as unworthy of a free man and merely as a mechanical activity more suited to the slave class. Gaius Fabius Pictor, who came from a noble family, was looked down on with contempt by Romans of his own social class because he had painted in the Temple of Salus, about 304 BCE. Even later, when artists painted works to the greater glory of the Republic, showing the course of victorious campaigns against the enemy (the triumphal painting was from a very early date one of the most typical forms of Roman art) the majority of such artists were not Romans. The artist in Rome never attained the consideration and social status that he had enjoyed in Greece, even when the passion for collecting works of art became widespread among the upper classes. We know the names of hardly any Roman artists, and even the greatest masterpieces are generally anonymous. To us Roman art seems like some collective entity dedicated to the glory and commemoration of the State and its structure. None of this glory was ever reflected back on to the artist. This is quite different from what Phny tells us, speaking of Greece: 'Above all, the young men should learn the practice of the graphic arts, that is to say painting on wooden panels. And this must be regarded as the first step in the liberal arts, and has always been held in great honour insofar as it has always been practised by free citizens ... and always been forbidden to those of servile condition. There is no record either in painting or in sculpture of any work by slaves.' And it was only on account of this Greek influence that the Emperor Hadrian, a Graecophil, did not himself scorn to practise the figurative arts. It was during the period of the struggle against the colonies of Magna Graecia followed by their submission that Rome made direct contact with Greek art. In 212 BCE the triumph of the consul Marcellus, conqueror of Syracuse, was commemorated with the most splendid works of art from that city. The cultural avant-garde openly praised Marcellus; he, on the other hand, was harshly rebuked by the conservatives. 'The Muse with winged step had been introduced amongst the proud and warlike people of Romulus.' Marcellus had inaugurated a new tradition that proved fundamental to the figurative culture of Rome. Three years later, the sack of Taranto yielded even more splendid treasures, among them the Hercules of Lisippus, which was placed on the Capitol. During the first twenty years of the second century BCE, the conquests of Asia brought the Roman environment into direct contact with some of the great centres of Hellenism. The artistic sway of Hellenism now extended to Rome, and the conquest of Greece was to complete the work. As Horace said: 'On being captured Greece took her coarse victor in hand and introduced the arts to un-civilized Latium'. Cato might still fanatically fight his rear-guard action: 'There are far too many I hear admiring and praising the works of Corinth and Athens, while they laugh at the clay images of the Romans ... '; but the more progressive Romans, dominated by the Philhellenic circle of the Scipioni, did indeed laugh at the old terracotta statues and at the ancient Etruscan ones and their provincial imitations. They all seemed impossibly 'old'. Roman artistic society had grown up, and Rome herself was preparing to change her appearance. The second century BCE was the epoch of the great urban transformation. It was then that the first monumental buildings arose, the new bridges (the Milvian bridge dates from 109 BCE), and the new aquaducts. The Forum gradually lost the aspect of a rural market and acquired that of a modern business city. The basilicas (the Porcia, the Aemilia, the Sempronia) became the centres of economic life and furthered the disappearance of the old tabernae, the shops that had jostled each other on the square. Greek influence was particularly noticeable in sculpture, in the portrait statues, those effigies errected in the Forum to honour worthy citizens - a fairly ancient tradition that had taken root in the second century BCE. The commemorative inscription on the bridge over the Tagus at Alcantara says that 'this bridge built by the noble Caius Julius Lacer with divine art will last for ever in the centuries to come'. Although it is true that Lacer lived during the Trajan epoch when art was regarded more highly than in the Republican era, we do not find anything in similar spirit recorded about a painting" or sculpture. The practical spirit of the Romans, once it had infused the figurative arts, acted as an indestructible foundation for all artistic activity, even during those periods most subject to Hellenistic influence. It is not mere chance that the only treatise written by a Roman on the figurative arts to come down to us is the 'De Architectura' of the Roman architect Vitruvius (c.78-10 BCE). The temple of Fortuna Virilis at Rome, the Temple of Hercules at Cori and the Temple of Jupiter at Terracina all date from the period of Sulla. In them Greek and Etruscan elements have been merged to give a new sceno-graphic vision. It became customary to place the temple. which was raised on a high base, at the end of a square, so enclosing it on that side. With the new building techniques of the Romans a more complex and articulated architecture became possible. From opus quadratum, using squared tufa blocks, the architects moved on to concrete - a most important innovation. This was at first faced with fragments and then came opus reticulatum, a regular scheme of squares or triangular stones. The new concrete was particularly effective because of its plasticity and economy. In 55 BCE Pompey built the first permanent theatre and thereby broke an age-old veto, dictated by prejudice, which had considered theatrical spectacles as useless, even dangerous to public morality. The erection of the Temple of Venus Genitrix on the summit of the auditorium certainly looks like a compromise attempt to render the event more acceptable to the conservatives. In the course of his few years in power, Caesar, with his law 'de urbe augenda' (concerning the increase of the city) had posed the problem of how to reconstruct the whole of the centre of Rome on a more monumental scale. And it is to him that we owe the first of the Imperial Fora (Forum fulii), situated next to the Republican one and dominated in the background by the temple of Venus Genitrix. For excellent well-preserved examples of painting from the era of Hellenistic-Roman art, see the Fayum Mummy portraits painted in Egypt (c.50 BCE - 250 CE). In the field of sculpture, the most widespread form was the portrait with the old underlying basis of realism. At times, especially in the funerary reliefs, this realistic representation assumed analytical, naturalistic tones. The directness of the approach in fact suggests possible connections with the idea of the wax mask that was formerly obtained from the face of a dead person and then kept by his or her relatives as a memorial. The tradition of sponsoring celebratory works to commemorate, for example, the exploits of a victorious legion, remained alive. 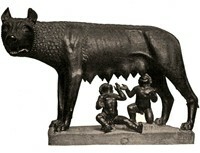 The history of Rome during the first century BCE was a vital theme in sculpture. The continuous frieze in the Basilica Aemilia (dating, perhaps, from the period of the restoration and enlargement of the basilica, 53-35 BCE) relates the primitive history of Rome in the eclectic style of the time, displaying classical and realistic modes side by side. As the Greek influence in Roman art increased, so Greek sculpture and painting assumed new, important dimensions and took on a new decorative function. For example, Sulla owned a Hercules of Lisippus - which in itself demonstrates the great progress that had been made since the time when Camillus was accused of decorating his door with bronze knockers taken from the booty of Veii. Now, the cultivated and wealthy classes of Rome turned their attention to neo-attic plaster copies of famous Greek bronze or stone sculptures and used these to decorate their atria, gardens, libraries and other main rooms. Even the paintings in private houses, typically landscapes, were used as background decoration - as may be seen from the tempera wall paintings of Pompeii. At the time of Caesar's death, the cultural situation that had prevailed in the first days of the Republic was reversed: Rome had become the centre of attraction for artists working in the territories subject to her, and, furthermore, the centre from which the most significant artistic ideas were elaborated and sent forth.  For more about the evolution of the visual arts, see: History of Art.  For more about early Roman painting and sculpture, see: Homepage.